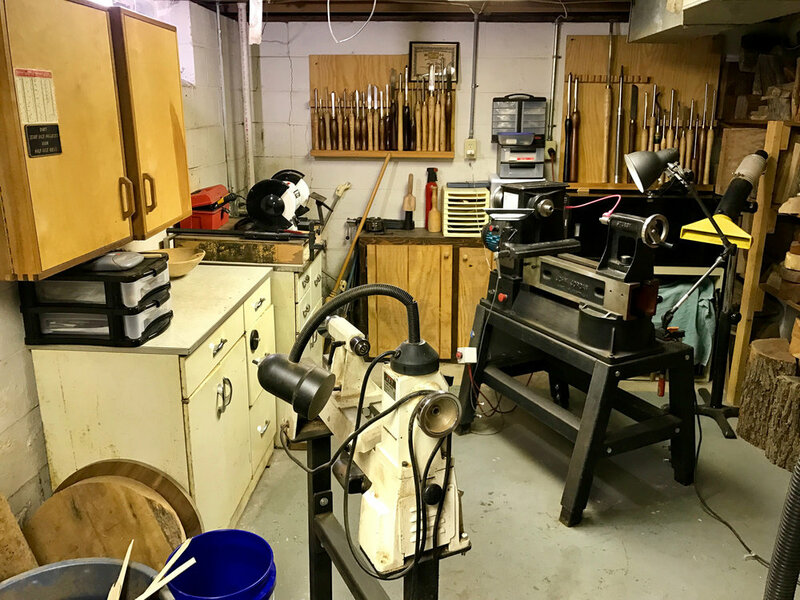 My workshop/studio space is very compact, compared to many of the shops I've visited while traveling to woodturning groups and colleagues around the globe. My space is in the basement, and I share this room with the utility area of our home (i.e., laundry room and furnace). Since I usually work on a small scale, it works for me - except when entropy happens and the clutter accumulates. That had happened between 2012 and 2017 - to the point where it was difficult for me to work here. My New Year's resolution for 2017 was a major shop cleaning, and I've maintained sanity in there ever since. That has resulted in me wanting to make art much more often. My primary time for making art is on the weekend and on a couple of evenings during the work week. I also exploit holidays that are associated with the academic cycle - especially winter break. When I'm not on a heavy travel schedule, I have more time. Alas - that's not been the case for the past five years, but my schedule has settled down a bit this year. I guess one take-home message for this article is that one doesn't have to have a huge workshop or studio to make art. This is the space I've used ever since I started my journey into the world of wood art, beginning on Christmas Day, 1998. I use a Stubby 750 lathe most of the time, but also have a Jet mini lathe. My wood is stored on shelves, which occasionally get rearranged as new blanks are added or used. 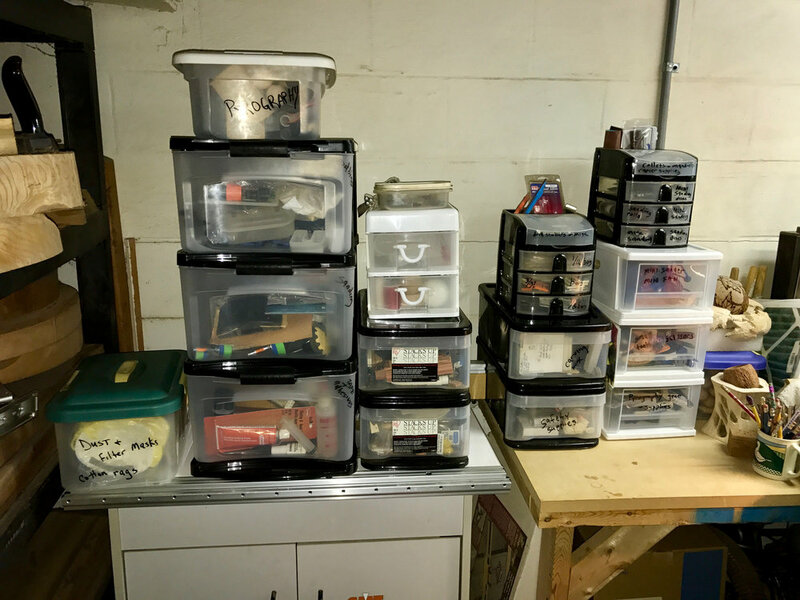 My corner in the back is for tool storage, and I have a small cabinet top that serves as a workspace when it’s not loaded with turning tools in use. I designed and built a carving bench, which is usually loaded with my micromotor carving unit and my pyrography gear. There’s an NSK Presto on the right. The air compressor lead is that yellow coil, and my Foredom tool hangs from the rafters. Here’s another view of my carving station. I use a drafting chair for positioning myself at a comfortable level. The curve of my carving bench enables me to brace my arms or hands to take the tension off of my shoulders while I work. My dust collector for the space is a JDS 2000 - an essential component, given that I share my space with the home furnace. My extra burs and miscellaneous carving and pyrography gear is within easy reach. My initial dust control is via a fan collector at the top of my carving bench. I use a Sil-Air compressor. This is a very quiet compressor - it makes about as much noise as a refrigerator. For my small space, this is perfect for carving. A major drawback for my space is that I don’t have air lines throughout the shop. Maybe someday I’ll hire a contractor to fix that. Keeping all the little tools, and bits and pieces organized is a must for a small space. I have all my storage drawers labeled, and I make an effort to return things to their proper places after a work session. That doesn’t always work, of course, but I have been trying to keep the shop relatively uncluttered. I have a relatively small bandsaw, which is appropriate for the work I do. It does limit the size of my turning blanks, but there’s always the chainsaw if I need to trim a larger blank. A closer look at the real workspace. I repurposed this from my neighbor’s shop. I love this lathe! It’s such a great machine, and the compact footprint is perfect for my small shop. The bed can slide out to make a longer stretch, and I can turn the bed. Also, I have another extension that can be attached on the left side, just under the control switches. The control switches can be moved to more convenient spots for whatever project I’m working on. Every woodturner has a lifetime supply of wood… I like big leaf maple the best, so I collect it when I’m out in the Pacific Northwest. I enjoy visiting sawmills that cater to turners and fine furniture makers. Ray Key was a larger-than-life character, and a masterful woodturner. He passed away in September 2018. In honor of his memory, more than 100 woodturners from around the globe were sent rough-turned pieces that were in Ray’s shop at the time of his death. Each artist was asked to complete the piece in their signature style. This post is a story about my memories of Ray Key. Women in Turning EXCHANGE 2018. One of the more important missions of the WIT Committee is to facilitate interaction among women turners, and to encourage women to help each other learn. A prime example of the kinds of interactions that foster this positive environment is the WIT EXCHANGE that takes place in September, at Arrowmont. We had our first, ever, EXCHANGE last fall. 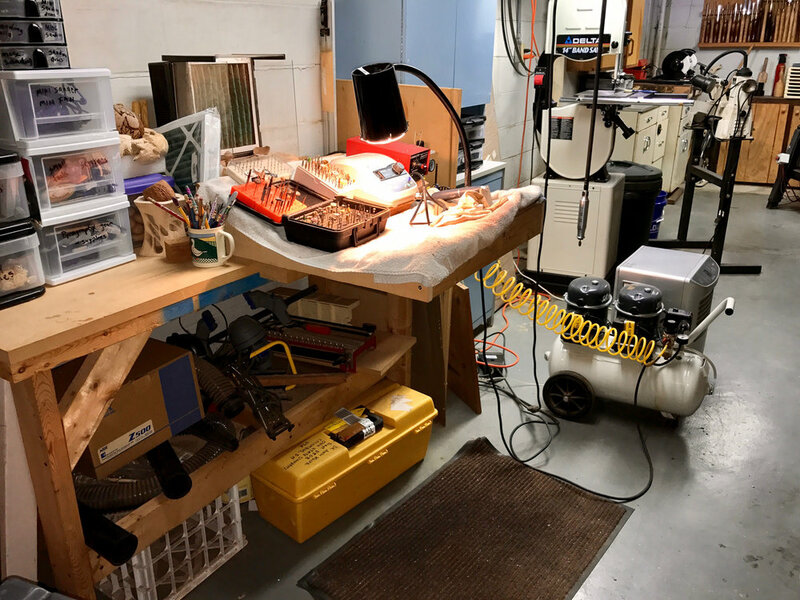 Every wood artist needs a workshop…. I had a lovely visit with a couple of clubs in California last weekend.